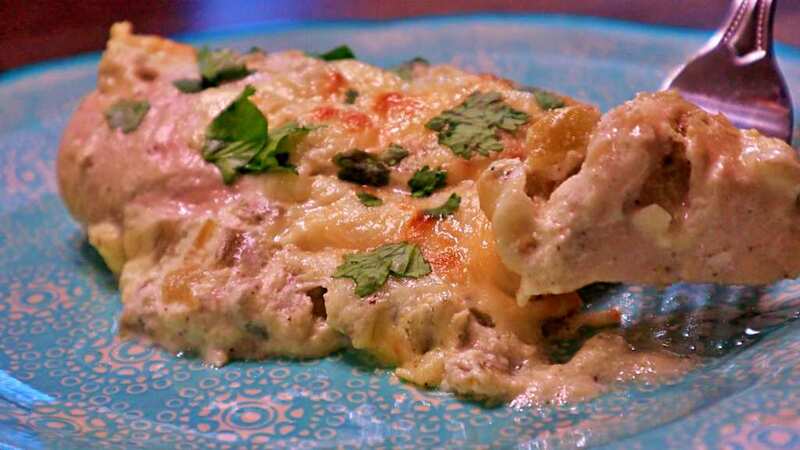 This Keto Pollo Fundido Recipe is delicious, and super easy to make, if it weren’t for that bubbly Monterey Jack on the top, you could almost get away with cooking the rest of this in a Crock Pot if you were feeling creative. I personally prefer it bakes in the oven with the cheese all leoparded on top like a nice pizza! In a Large Mixing Bowl add 8 Ounces of Cream Cheese (Softened – Not Whipped), then season with the Granulated Garlic, Cumin, Pink Himalayan Salt, and Black Pepper. Stir generously to combine the seasoning well. Add 4oz of Diced Green Chilis (I prefer the canned variety, just be sure to drain them thoroughly) to the Cream Cheese mixture and fold them into the Cream Cheese mixture to get the Green Chilis nicely incorporated. In a Large Baking Dish place the full Chicken Breasts on the bottom and be sure to space them out evenly. It is okay if they are crammed in there side-by-side but just be sure that they are not overlapping or else they may not cook evenly. Spread the Cream Cheese mixture across the top of the Chicken Breasts to cover them completely. 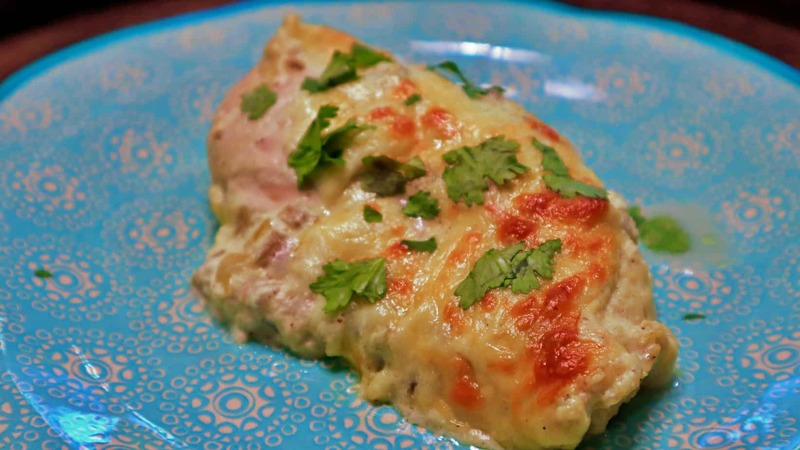 Shred 1 Cup of Monterey Jack Cheese, and top the smothered Chicken Breasts evenly. Place in the middle oven rack for 45 minutes at 375*F.
Take out when chicken is cooked all the way, and allow to cool on counter for a few minutes before serving. It has 2g of sugar. Is that allowed in Keto? Yes, because there is no actual sugar added to it. That comes from the Cream Cheese and the Chilis. Made this tonight. Delicious whether you’re eating keto or not. I made this dish this week. It’s delicious! Made this tonight and WOW!! Absolutely amazing!!! Is that 62g of protein per serving a typo?